In 1913 the periodical Carriage Trade carried the happy news, "It will be a pleasure to the trade to know that two of the best known men in the varnish business, W. F. Egan and T. J. Ronan, together with Mr. Hausman, an expert chemist, have formed a new varnish company, styled The Egan-Ronan-Hausman Co., Inc., the main office being located at 62 Water Street, Brooklyn, N. Y. Mr. Egan needs no introduction to the hundreds of carriage builders in the Eastern States, with whom he has had pleasant business relations continuously since 1882. It was in that year he went with John W. Masury & Son as a salesman, remaining with the house until within the past few weeks. He covered for them the Philadelphia, Baltimore and Washington territory. Previous to 1882 Mr. Egan served as a carriage painter and finisher with one of the best custom vehicle builders in the country, the well-known William D. Rogers, Philadelphia. Mr. Ronan can claim an equally extensive and long-time acquaintance with the vehicle trade, having twenty-five years to his credit with the Masury company, during the five of which he acted as a varnish expert and specialist. Mr. Hausman's experience, while not directly associated with vehicles, is such as to qualify him in a high degree for the work he will undertake in connection with the new varnish company. A chemist by profession, he has successfully served in that capacity with the Du Pont Powder Co., the Bridgeport Wood Finishing Co., and lately has been superintendent for a large enamel concern. The Egan-Ronan-Hausman Co. specializes in high-grade oil and japan colors, varnishes, enamels and Manufacturers' coatings. But on account of the long and close study which each member of the firm has made of the whole paint and varnish proposition the company is more than a manufacturer. Its members, constituting, as they do, a trio of experts, are well qualified to receive the title, "paint and varnish engineers," to the trade, and as such they offer not only their product, but their services to vehicle manufacturers." T. J. Ronan mentioned in this account was Thomas J. Ronan (1858-1929). He formed his own company, the T. J. Ronan Co., in 1920. This was announced in The Painters Magazine and Paint & Wall Paper Dealer, vol. XLVII, no. 10, October, 1920, "Thomas J Ronan, formerly secretary and treasurer of Egan, Ronan, Hausman Co., Inc., Brooklyn, N. Y., severed his connection with that company in October, 1919, and in January, 1920, formed a corporation under the name of T. J. Ronan Co., Inc., which is located at 17 and 19 Atlantic avenue, Brooklyn, N. Y. The plant at this location is equipped with up-to-date machinery for the manufacture of automobile colors, color varnishes, oil colors, industrial coatings, flat whites and enamels. Associated with Mr. Ronan are the following, all of whom were formerly with Egan, Ronan, Hausman Co., Inc., in the following capacity: Arthur T. Ronan, salesman in New York City; Edward A Hofheins, salesman in Western New York; George W. Miller, superintendent; Miss A. W. Reinhard, private secretary. The officers of the corporation are: Thomas J. Ronan, president and treasurer; A. T. Ronan, vice-president and secretary." This ad for Egan-Ronan-Hausman Co. appeared in The Painters Magazine and Paint & Wall Paper Dealer, January 1920. This must have been very shortly before Thomas J. Ronan left to found his own company. Thomas J. Ronan's son, Arthur Thomas Ronan (1888-1946) formed part of this original T. J. Ronan Co., which was located on Atlantic Avenue in Brooklyn. Arthur T. Ronan's obituary in the New York Times, 3 Aug. 1946, pg. 11, read, "Mount Vernon, N.Y., Aug 2 - Arthur T. Ronan, president of T. J. Ronan, Inc., paint and varnish manufacturers at 749 East 135th Street, the Bronx, died here last night in his home at 402 Westchester Avenue. His age was 57. Mr. Ronan was born in New York, a son of Thomas and Mary Salter Ronan. During the first World War he served as a second lieutenant in the cavalry. He was a member of the American Legion, the Society of Automotive Engineers, the Elks and the Bronx Rotary Club. He leaves a widow, Mrs. Elsie Schuster Ronan; his mother, a brother, John A. Ronan of Brooklyn, and two sisters, Mrs. De Long Philson of Pelham, N. Y., and Mrs. Andrew Birgel of this city." By 1933 when T. J. Ronan Co. moved to the Bronx, Arthur T. Ronan had been joined by his brother, John Aloysius Ronan (1896-1955). John A. Ronan died in spectacular fashion, as reported in the New York Herald Tribune, 31 Dec. 1955, pg. 3, "Reno, Nev., Dec. 30 (AP) - John A. Ronan, fifty-nine, New York City business man, leaped to his death from the ninth floor of the Mapes Hotel in downtown Reno today. He left two notes in his sixth floor room at the hotel blaming gambling, drinking and financial worries, officials said. Mr. Ronan, whose New York address was listed as 215 W. 14th St., was associated with the firm of T. J. Ronan Co., manufacturers of black light equipment and advertising paints in New York. The residence of Mr. Ronan's widow was listed as the Hotel Granada, in Brooklyn, N. Y." T. J. Ronan Co. was listed in the Bronx telephone directory at 749 East 135th Street in 1933. This story in the New York Times, however, makes it sound as if the move was in 1938, "The five-story and basement building at the northwest corner of Willow Avenue and East 135th Street, the Bronx, containing about 30,000 square feet of space, has been leased for a long term from E. C. Ramsey by the T. J. Ronan Company, Inc., who will occupy it for the manufacture of paints and for the firm's general offices." (Times, 2 Feb. 1938, pg. 35). Possibly this was a renegotiation of a lease. Ronan Paints left the Ronan family in 1953, and more recently has been the subject of dispute between contending owners. As reported in the New York Times, 1 Sept. 1989, "Now in its 13th year of litigation, the long and tortuous legal battle over the T. J. Ronan Paint Corporation has assumed Dickensian proportions ... all in a dispute over the ownership of a paint manufacturing company with a dozen employees and annual revenue of about $1 million. Mr. Lennon [Edward J. Lennon, Jr.] and John Doran, two lifelong paint manufacturers, bought Ronan at a bankruptcy sale in 1953 and decided to split the stock 50-50 and run the company together. ... Most of Ronan's assets were finally sold at auction in 1985 to Mr. Doran for $1.6 million after he outbid his former partner by $100,000. .... For the last six months the lawyers have been arguing over the remaining assets of the dissolved company, about $700,000. ..."
As of 2015 the Ronan website supplied the following, "T J. Ronan Paint Corp. has been supplying the paint industry with quality paint products since 1889. We are recognized as leaders in technology for Sign paints, Water Based Coatings, lead free products, Clears, Japan Colors and Faux Finish. 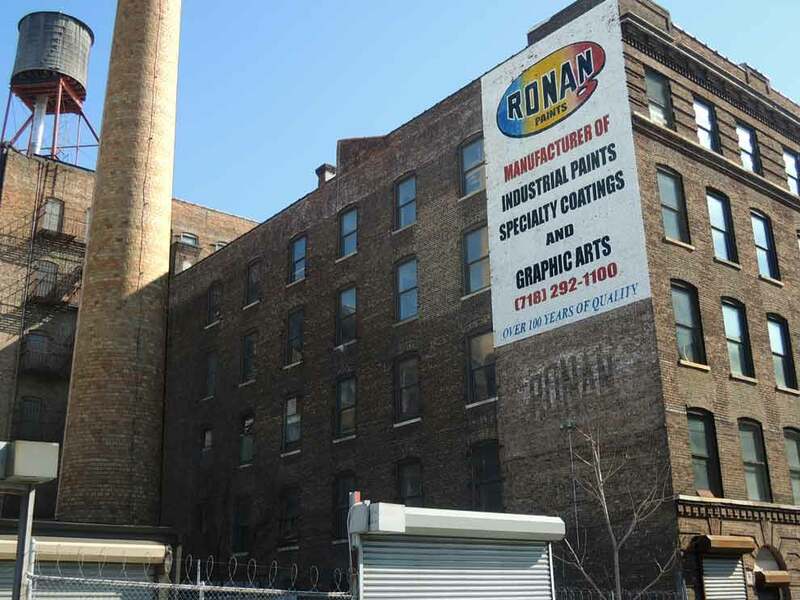 T J. Ronan Paint Corp. / 749 E. 135th St., Bronx, NY 10454 / Phone: 800-247-6626 / Fax: 718-292-0406 Email: info@ronanpaints.com."